The National Theatre Live series recently brought Kenneth Branagh's new Macbeth to Chicago, and of course, I simply had to be there. The line was long, but it moved quickly, and after a brief interview of co-director Rob Ashford, the production began. The weird sisters were perfect. The staging (inside an old de-consecrated church) was original and compelling. Branagh was the usual way, with all the gusto, if a bit misplaced, of his familiar Henry V. When Lady Macbeth finally arrived, Alex Kingston's rendition was... terrifying, but not in the Lady Macbeth way. I thought it was just Kingston's character and acting in Doctor Who that I found distasteful, but as it turns out, her overacting to embarrassing effect is not limited to the sci-fi realm. Her inane shouting of lines would be unwelcome in any other role, yet the power of Shakespeare seems to have overtaken her -- and Branagh by way of proximity. Kingston's ridiculous style leads to a manic symbiosis devoid of the substance and evil conviction required of the Macbeths. These stars relegated to character actors for the production, the true artistries of David Annen (Siward), Ray Fearon (Macduff), and Alexander Vlahos (Malcolm) are revealed. As we all poured out of the theater after the new Scottish king was named, I overheard the comments from fellow audience members, including one awestruck review of Branagh's "Tomorrow and tomorrow and tomorrow" speech, which was, in my opinion, rushed and confused. Am I a snob? I wondered. Do I just like my Shakespeare the way I like my Shakespeare? Am I not open to the merits of new productions and interpretations? After all, this is Sir Kenneth Branagh I was so nonchalantly criticizing. On the way home from the theater, I recalled a moment many years earlier when my father, my granduncle, and I were all sitting in the car listening to Maria Callas recordings. My granduncle, a lifelong opera lover and connoisseur, was quick to say, "That one was not very good," after a particular aria. I was flabbergasted. How could he so easily criticize La Divina? It occurred to me, as I complained to a friend about Alex Kingston, that my granduncle did not revere Callas. He viewed her work as the work of any other artist -- imperfect, vulnerable to criticism, but valuable nonetheless. David Wong wrote, "there are two ways to dehumanize someone: by dismissing them, and by idolizing them." By putting Callas or Branagh or anyone else on a pedestal, not only do we neglect their humanity, but we also neglect our own. We stifle our criticisms. We convince ourselves that our opinions don't matter. There are, of course, areas in which dissenting opinions are wrong. But in the realm of art, in which arguments can be made for and against the value of just about anything, smart, thoughtful criticism should always be welcomed. If we are to have an intelligent global community in which the arts are valued, "I don't like it" won't cut it. I'm halfway through spending this week in Boston, and right after my plane landed on Monday, I grabbed lunch and headed to the MFA for the John Singer Sargent watercolors exhibit. The above Bedouins was particularly moving: just as in his oil paintings, Sargent's use of color is vivid and fearless. I thought back to my Macbeth experience when a gentleman in the gallery explained to his companion that once he's seen a few Sargents, he's seen them all (or something to that effect). I wanted to tell him all the things I found wonderful about the paintings, just as I'm sure the raving Branagh fan would have wanted to tell me his thoughts on the "Tomorrow and tomorrow and tomorrow" speech. But I brushed it off. 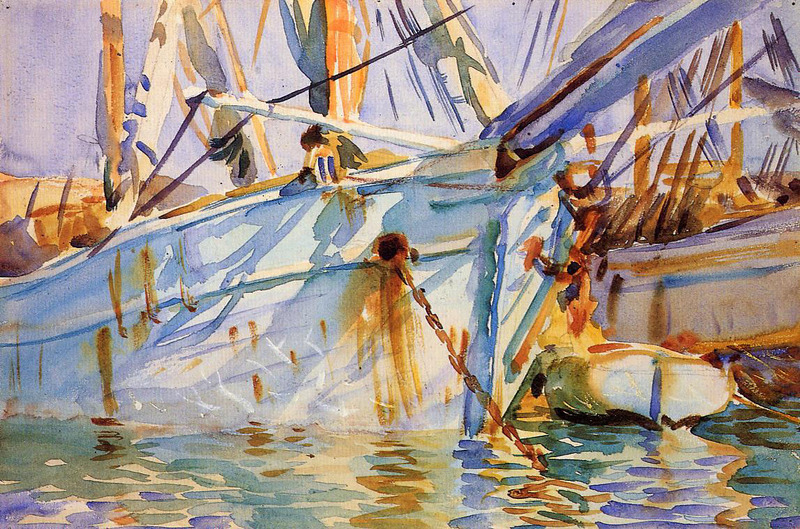 The gentleman's criticism is valid; Sargent produced a massive number of watercolors, and since everyone values different stimuli in art, a room full of Venetian waterscapes may not be the most captivating experience. But I was moved by the watercolors, and after the museum closed, I, eager to make something, bought a handful of brush tip markers in my approximation of a Sargent palette. I paint with acrylics and watercolors when I feel that familiar need to do so, and rather than being intimidated by the incredible mastery on display in the museum, I felt invigorated to attempt the same. Reverence holds us back from many things: from criticizing and expressing when we are detractors, but also from participating even when we feel invited to do so. So many reverent students of art experience the grand works and feel dejected; their idolization prevents them from believing that they too can reach similar greatness. I rather prefer skepticism: skepticism that a particular performance represents the be-all and end-all of interpretations, and skepticism in the face of self-doubt. The bottom line is that our minds should always be open -- to self-expression, to artistic endeavors, and to the possibility that we may be wrong. If reverence tells us to be silent in the face of grandeur, skepticism is what keeps our minds working. It's what teaches us to examine, and not to accept supposed truths at face value. Skepticism encourages us to engage, to learn more, and never to be complacent.